Four police were injured in an attack while trying to enforce the restitution of land in Mutata, Uraba Antioquia Thursday, the latest chapter in onogoing conflict in the implementation of the 2011 land restitution law. The identities and condition of the four policemen who were injured has not been released. Four uniformed police were wounded and immediately transferred to a care center in Mutata. There they were stabilized and sent by helicopter to the Pan American Clinic in Apartado. According to the commander, the attack has been attributed to the Carlos Vasquez band of the Gaitanista Self-Defense Forces (AGC). The criminal band approached the patrol car and opened fire. The Victims and Land Restitution Law was passed by former President Manuel Santos in June 2011 in order to return land to victims of widespread land theft during the internal conflict, 15% of the national territory. Since 1994, about 8 million hectares of land has been stolen – the size of a small country- displacing millions of small farmers. According to statistics from Santos’s administration, 93.75% of this land is now owned by individuals, corporations and former paramilitary commanders. 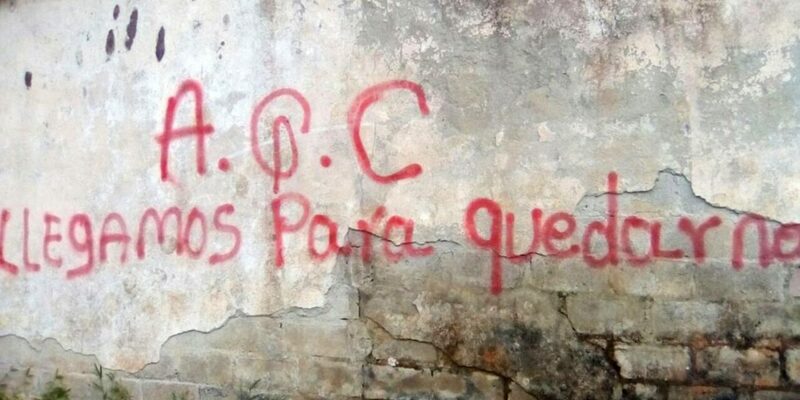 The AGC, who perpetrated the recent attack, are now Colombia’s most powerful paramilitary group, and control major drug trafficking operations throughout the country. They were formed by AUC dissidents. The group has a stronghold in Uraba, where the recent attack on police protecting land restitution workers took place, and has assassinated policemen in the region. In addition to drug trafficking and illegal gold mining, they extort local businesses. The government has previously called the “Urabeños,” “Clan Usuga” and the “Clan de Golfo,” and refuse to recognize them as a paramilitary organization.